If you are reading this then you were not re-directed to the new RJ’s Corner. This version is now in limbo. click TheNewRJsCorner to go to the new version. I hear all the latest rumbling (as in ready to explode in a bout of diarrhea) about how the peace accord worked out with Iran is so worthless. Some seem to think that our only solution to conflicts around the world is war. “Blow the bad guys away” is their mantra. Of course the loudest of these critics are the Republican presidential contenders and those in Congress. I got an idea to turn that around. How about we send all the kids and grandkids of those folks off as the first line in the battle. Let’s make them put their loved ones lives on the line. I bet if that were a requirement the opposition to trying peace this time would quickly die out. There is nothing like “skin in the game” to change people’s attitudes. In the same light there are all those senior citizens out there that are so opposed to allowing our citizens to obtain reasonably cost healthcare. How about taking all those folks off Medicare and let them fend for themselves in the cutthroat business pre-ADA. I bring this idea up frequently when I get into it with them and have yet to have any of them accept my proposition. When I looked in the back of the bed I found a hand-scrolled racist sign about our president it ruined the moment and cheapened the item it was attached to. I won’t show or repeat the sign here but I have found variations of it several different venues. I tried to erase that sign and just enjoy the truck but it was difficult. I recognize that I am in a very red State and there are a lot of older generation racists and bigots still around but these signs still give me a shudder when I see them. How can someone hate someone else so much, let alone POTUS, the leader of our country? I am into old trucks and the cable TV car shows lately. I can’t do that stuff anymore but still enjoy being able to do it through someone else. But then again I am currently still working on my micro-RV (uRV) which takes my 24 year old truck and furniture delivery cap and turns them into a single person RV with many bumper stickers and travel decals. This blog has been in a three month hiatus due to me just getting tired of the political dialog. I have made some basic changes to prevent that from happening again. One thing is that while I will continue to allow comments, at least for now, I will not reply to many of them. I know this is not good blog etiquette but that is the way it has to be for me to continue here and keep my sanity. I know all you young folks out there who might accidentally come across my blog know very little about the history of prosperity but most of the older folks have recollections of more prosperous times. I can remember the 1950s where everything seemed to be going well for many of us. We couldn’t build enough houses or cars to meet our needs. Instead of our returning vets coming home to unemployment, jobs were being created at a vigorous rate. The 1960s was my decade for growth. Even though I was raised in the single parent household and my father was a milkman I managed to get accepted by a great State college and worked my way to a bachelor’s degree paying all the expenses by working in a dormitory cafeteria up to 40 hours a week. It was a struggling time but probably the happiest of my life. I made such good friends during those years before I became deaf. In the 1970s things started to change. Good middle class jobs for those without a formal education beyond high school were starting to disappear.The Oil Embargo put a hamper on things and inflation was roaring along. Things were starting to change by the end of that decade and then came the 1980s. The 1980s seemed to be a pivotal decade. It is the time when we elected a very conservative president who believed that government was the main problem in our society. It was a time when the elite among us began to get inordinate influence in our society. It was a time that the social conservative that seemed the dwarf the emphatic among us. 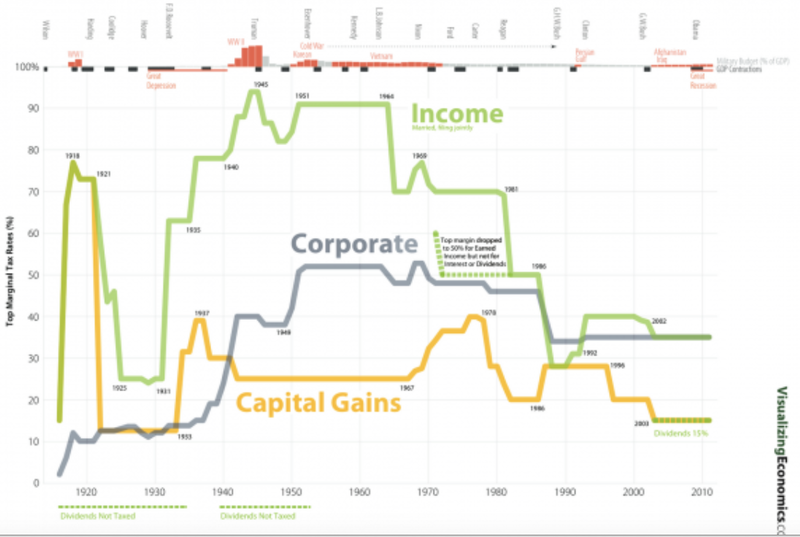 It was a time when the rich started getting much richer. It was also a time when the MBA college degree started taking root. The MBA degree taught that people where no longer to be considered valuable members of a company but instead liabilities that needed to be trimmed as much as possible. At that point the middle class shrinking came fully into force. The 1990s, or the Clinton years as I knew them, brought back prosperity at least the a degree and to a limited segment of society. These were my most productive years from a financial standpoint. My retirement funds and 401k’s grew at a rapid pace. The growth of the stock market rivaled that of the 1930s. A new thing called the Internet was taking hold of everyone including corporate America. I took advantage of the trend by re-purposing myself into an IT guy (information technology). I was suddenly in demand for my skills. but toward the end of the decade panic started. Luckily I got pretty much out of the stock market before the crash. The 2000s were a very pivotal and dramatic decade that saw the stock bubble burst and then years of a stagnant economy. When Mr. Bush came into the Oval Office the DOW Industrial averages were at 11,000, When he left eight years later it was at 8,000 and due to too much deregulation much of the banks were on the verge of bankruptcy along with a couple of our biggest corporations. The 2010s finally ushered out the president who started two wars and huge increase in military spending. The new president managed to get us out of these two catastrophic emergencies and as a result in six years the DOW averages went from 8,000 to 18,000. So, studying the above graphs let’s recap all this. When the super rich were being taxed at up to 90% of their income we had prosperity. Then when that was reduced to about 30% things started falling apart. I think you should get the idea that giving big tax breaks to the super rich is not a way to get us once again to prosperity. I am way over my word limit here so I have to stop.